Well, I finally got it off the loom before it reach a year. I basically had to bulldoze through this project because I wanted to use the loom for other things, but the yarn was too expensive for me to just cut off and call it a day. Here are my lessons learned from the project. This yarn (Handmaiden Sea Silk) needs to be sett a lot closer than 12 epi to weave something other than plain weave. I had planned and threaded a ribbed pattern, but did the sett at 12 epi because I like to have my scarves at least 6 inches wide and needed that low of a sett to get the width I wanted from just one skein of the yarn. As it turns out, 12 epi is pretty loose even for plain weave for this yarn which caused other problems that I will get to later. Even though I had plain weave as a back up plan, having to go to the back up plan really took the wind out of my sails for this project. It turns out the “ribbed for my pleasure” was a big thing for me. Because of the loose sett, I wound up with problems with the weft yarn shifting when advancing the warp and setting the tension again. I was able to fix some areas after I got it off the loom, but it eventually because “What the hell.” and I just put it in the washer for fulling, hoping that the motion in the washer would nudge the problem areas back into place. That did not happen. Las weekend I purchased some duck cloth to make an apron for my baby wolf loom that should help with some of this problem. I hope! This yarn, being intended as a knitting yarn, is a bit too soft for me to use as a warp. It suffered from abrasion, though never to the point where I was afraid of a warp end breaking on me. I just have some fuzz balls to pick off the scarf, due to the abrasion from movement in the reed and the heddles. 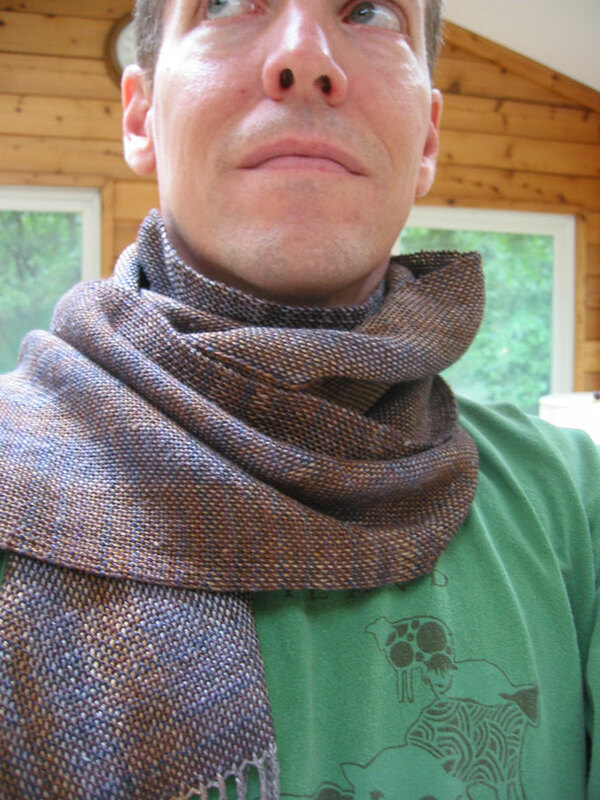 I decided to use my ski shuttle for the weft, and wound as much of the weft skein onto it as I could, in hopes that I would be able to weave the whole scarf without having to joins. Towards that goal, I was successful. 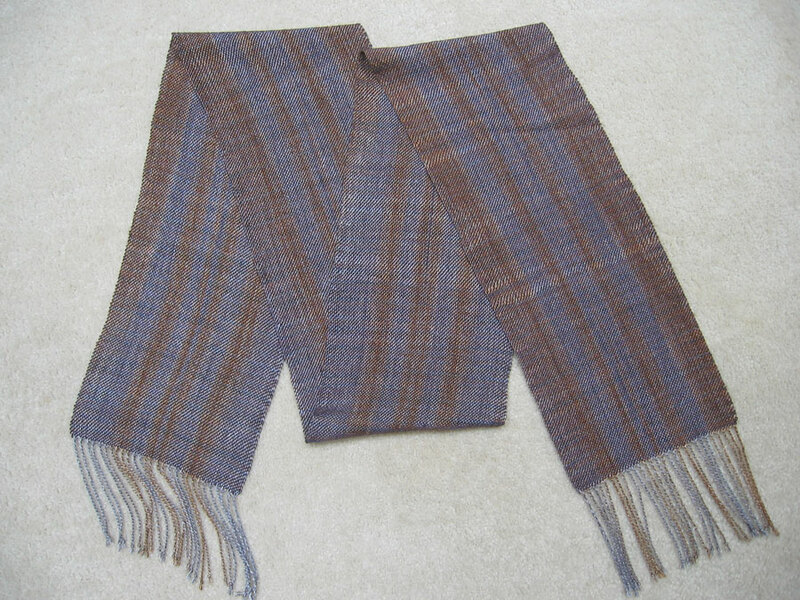 This scarf is woven with one continuous strand of weft. The bad part is that using the ski shuttle for this project became a pain, causing me to have to make bigger arm movements with each weft shot than I would have had to do with my boat shuttles or my end-delivery shuttles. Joins aren’t all that bad after all. It is better to be lucky than good. When winding the warp on the warping mill, I noticed how the colors were falling in line, so rather than sleying the reed starting at one end and working toward the other end, I started in the middle of the reed for the first thread, and then alternated sides with each successive warp thread. This kept the colors together and gave the effect of a painted warp without actually having to do any warp painting. Win! Doing the blanket twist fringe in very small groups was worth it for this yarn. Two warp ends were twisted together, and then allowed to “untwist” on another two warp ends that were similarly twisted. With as light weight of a weave this turned out to be, a light weight fringe was needed as well. Looks dashing with a ratty old t-shirt, no? 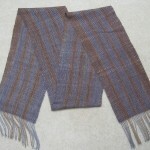 This entry was posted in After, Clothing, Weaving by textillian. Bookmark the permalink. Well, it does look dashing! Very British with the scarf and tee shirt thing! Here is to flinging stuff down laundry chutes! It does look dashing on you! So much work, it is interesting to hear about how yarns work out for weaving. 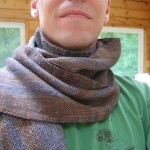 I’ve heard most yarns are spun for weaving and I learned a lot from reading your post. omg..! Of course I don’t understand one thing about all of this since I have yet to learn this! But I love how it looks and would wear it proudly! Even in a ratty “T”!